When a young Ralph Nader wrote a book about automobile safety, it made him a household name across America. The experience sparked a lifetime of service to numerous safety, political, and environmental causes. Alex Wong/Getty Images. Reproduced by permission. which continue to save lives. His other early work focused on food safety, nursing homes, and water and air pollution. Arguably, the most effective group that Nader founded is Public Citizen. This organization, with the support of 150,000 members, serves as a lobbying group—working to present ideas and critical information to members of Congress, all in an effort to persuade them to vote in favor of public-interest issues and, many times, against the wishes of major U.S. corporations. Nader also led the fight against nuclear power in the 1970s and 1980s. He, Public Citizen, and other groups that he helped form played a major role in stopping the spread of nuclear power. In 1996 and 2000, Nader ran for president on the Green Party ticket and brought his views on environmental issues and social justice to a larger audience. Nader's campaign played a role in the close 2000 election as he pushed a progressive agenda and brought plenty of new people—many of them young—into the political process. He continues his work today from an office in Washington, D.C.
SEE ALSO P UBLIC I NTEREST R ESEARCH G ROUPS (PIRGs) . Graham, Kevin. (2000). 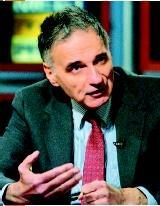 Ralph Nader: Battling for Democracy. Denver: Windom Publishing. Essential Information. Available from http://www.essential.org .